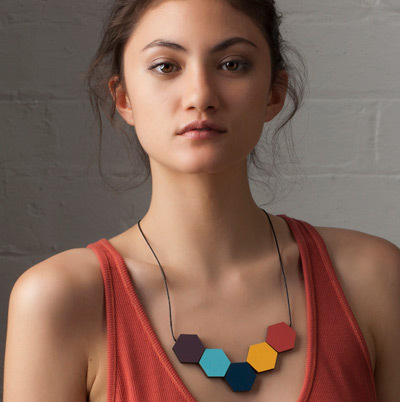 These necklaces are made from sustainable plantation hoop pine ply. The hexagonal beads are designed to flip and slide to suit your taste. I'm more than a little in love. There are lots of other great styles and colourways on the Polli website. You can find Polli pendants in the online store. These are super Steph, i'm thinking cooler weather necklace with tee and coloured cardi. My i love a cardi!